Recently I’ve received more questions than ever from women who have big chopped and finally entered the world of natural hair. Even with the abundance of information online I’m always shocked by how many women are still looking for help and guidance. In the past two weeks alone I’ve had my sister, a close friend and a stranger ask for advice. Because I’ve been blogging for almost 2 years now, my naivety set in for a second, thinking women would most certainly know the basics of natural hair. Well, I was wrong. 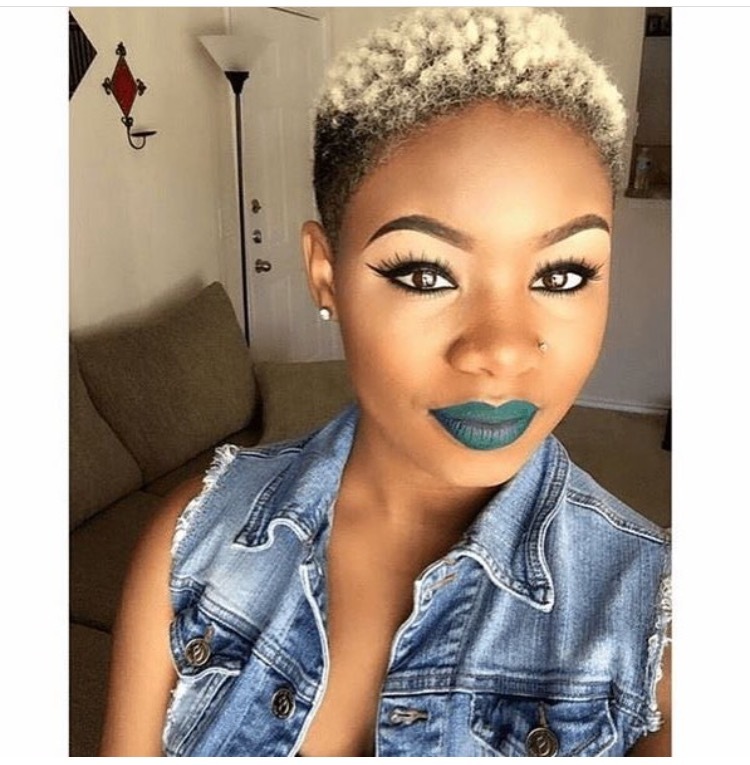 Here are 5 things you must do after you big chop. There’s a difference between cutting your hair off yourself, in your bathroom, vs. getting your hair cut a professional to make sure it is styled correctly. Depending on how short you go, I even suggest finding a trusted barber. After cutting you may be surprised by the actual shape of your head and it’s possible you won’t know how to make sure the remaining hair frames your face well. A professional stylist or barber will help to make sure your cut is stylish and on trend. A great shape-up goes a long way with rocking a super short look. The last thing you want is to cut all your hair off and hate the results. Talk to someone you trust and use inspiration photos to give your stylist or barber an idea of what you want. One of my dear friends Kala (@thekglifestyle) recently big chopped for the second time. Below are her results after getting her cut shaped up and her routine for defining her curls. As a new natural I’m sure you are anxious to try every product on the market. And trust me at some point you will (I can’t even count the amount of products I’ve tried). After you big chop take advantage of product samples before buying full-size products. Because shorter hair will cause for far less product, using product samples will save you time and money down the line until you build up your holy grail list. Some brands even sell smaller size product samples in stores now to help with this. Companies are realizing women invest a ton of money into hair care, but become even more frustrated after spending tons of money only to find nothing works for them. If you can’t find samples in store, request free samples from the brands you want to try. Shampoo: At the minimum, every 7-9 days. Healthy hair growth starts with a clean scalp. Shampooing weekly will help to remove product build-up, environmental factors, dust, sweat etc to ensure your pores aren’t clogged and hair growth can occur freely. Deep Condition: Once a week or each time you shampoo. Make sure you have a great moisturizing conditioner and a balancing protein conditioner. Trims: Every 8-12 weeks or as suggested by your professional stylist. Developing a healthy hair regimen after you big chop will put you in a great position for when you hair grows longer. By then you will have your favorites figured out and you will know what your hair responds well to as far as products. After you big chop more than likely you will be obsessed with your curls. This is normal but you should know your curl pattern and type (3c, 4a, 4c, etc) doesn’t matter. So stop stressing over that now. Here’s a little secret: healthy hair isn’t determined by your curl type. It has no bearing on how long your hair will grow or how fast it will grow. One key thing you should understand however is porosity. Porosity determines your hair’s ability to absorb and retain moisture. Since dryness is the number one problem natural hair women have, understanding this after you big chop will help dramatically. Here’s a little secret: healthy hair isn’t determined by your curl type. Every day. This is how often I moisturize my hair. Your naturally curly hair will be drier than your relaxed hair so accept that now too. This doesn’t mean taking care of your natural hair has to be hard, you just have to know how to combat dryness. Leave-in conditioners, hair lotions, or just simple H20 will get the job done. One of my favorite DIY refresher sprays consist of water, avocado oil, and aloe vera juice. You can get all of this at your local grocery store, including a $2-$3 spray bottle. Outside of what you put on top of your hair, don’t forget what you put inside of your body in a huge factor as well. You should consume at least half your weight in ounces of water. For example, I am 170 lbs, therefore; I need to drink at least 85 ounces of water (which is a little over 5 bottles). To make things easier at one point I just used my H20 on the Go Water bottle. Once I finish this for the day, I’ve pretty much reached my goal. Ever heard the saying “When a women cuts her hair she is about to change her life?” Well, I whole heartedly beleive this saying. For a lot of women (not all) hair is a very emotional connection. As a result, make sure you have a great support system around you after you big chop. The last thing you need is negativity and people asking when you are going to slap a perm back in your head because your hair looks “crazy”. Ain’t nobody got time for that! Instead, follow bloggers and vloggers you love, watch their videos and draw inspiration from people online. What other questions do you have about the big chop? Leave a comment at the bottom and let me know!